A river island is a part of the land which is surrounded by the gentle flow of a river and India is one of those countries in the world which possess several beautiful and marvellous river islands. However, when on one side, river islands like Majuli are extremely famous amongst tourists, on the other, there exist several river islands which are far away from being recognised by tourists. So, why not explore these river islands of India this season? Following are some of the major river islands which definitely deserve more attention. Read on to know more about these charming yet unexplored river islands of India. Being one of the largest river islands, Bhavani Island is spread over an area of 133 acres and is a famous tourist spot amongst locals. It is located on the Krishna river in the state of Andhra Pradesh and is named after Kanaka Durga Temple which is dedicated to Goddess Bhavani. Being surrounded by beautiful Krishna river, the environment on this mesmerising island is quite peaceful and vibrant. You can also visit the tiny man-made island which is situated in close proximity of the Bhavani Island. Apart from enjoying the natural surroundings of this island, you can also spare some time framing the beauty of several colourful birds living in and around the region. Located on Cooum river, The Island is situated in the city of Chennai. It is said that this river island is a result of the merging of Cooum river with the Elambore river during the early stages of the 19th century. The major spot where you can enjoy the beautiful environment of The Island includes the statue of Sir Thomas Munro. The Island is extremely popular amongst locals for the trade fair and the exhibitions which are held every year from January until the end of March. 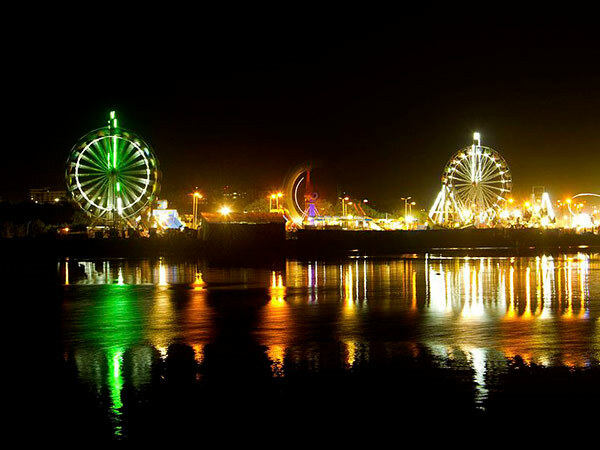 So, before this annual fair ends, get yourself to The Island to savour its unexplored beauty. The beauty of colourful lights reflecting over the dazzling waters of Cooum river is certainly set to steal the hearts of every visitor. Undoubtedly, one of the most beautiful river islands in India, Munroe Island is heaven itself. Nothing less can be expected from this island after being located on the lands of God's Own Country, Kerala. Well, if you are looking to explore something new, then you must add Munroe Island to your wish list now. Munroe Island is situated at the conflux of Ashtamudi Lake and the Kallada river and is a group of 8 islands. The major water activities which can be done in the relaxing waters of this soothing island include boating, fishing and swimming. You can also savour the beauty of houseboat cruises. Parumala is a small hamlet island located in the Pathanamthitta district of Kerala on the Pampa river. Flourishing under the shades of paradise, which is God's Own Country, it is natural for Parumala Island to possess authentic charm and the essence of nature. This beautiful tiny island is popular for its Parumala Church, which is one of the most prominent pilgrimage sites for Christians. The annual function of Ormapperunnal is held in the month of November within the compound of the church. Even though the church is immensely popular amongst Christians, the beauty of Parumala Island is always ignored. Apart from visiting its world-famous church, you can also spend some time savouring the beauty of its dazzling waters.